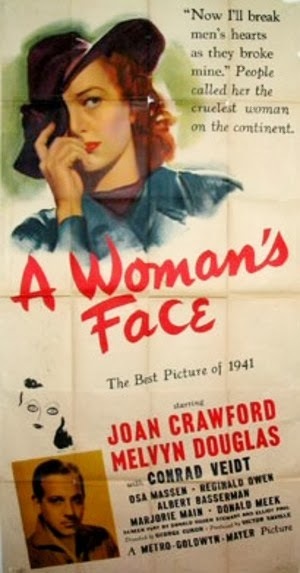 Joan Crawford plays Anna Holm in this remake of the 1938 Swedish film starring Ingrid Bergman. Both were based of the play Il Etait Une Fois by Francis deCroisset. She was warned by Louis B, Mayer that taking the role would ruin her career. This was in the days when Movie stars were supposed to look like movie stars, never less than perfect, and few actresses(Bette Davis was an exception) wanted to “dress” down for a movie role. But it was the role of Anna Holm that made people realize Crawford could act and she credits it with her eventual Oscar for Mildred Pierce. Anna Holm is a woman who’s life was shaped by an accident, a fire started by her drunken father when she was five. that left the right side of her face disfigured. She grew up embittered at everyone, but especially beautiful women. She wears hats with floppy brims that keep most of that side of her face covered or has her hair doing the same. She forges a life of crime, mostly as the head of a blackmail ring. Anna is on trial for first degree murder and the story is told in flashback as each witness relates their part of the story. executive in Sweden. The pair get close and he involves her in a plot to murder his uncle’s four year old grandson who stands to inherit everything and Barring wants that fortune. Melvyn Douglas is Dr. Gustaf Segert, the husband of one of Anna’s blackmail victims. She liked to play around with younger men and was injudicious enough to write love letters to one that Anna has gotten. She’s at the home to collect when Segert arrives unexpectedly and mistakes her for a thief. But he then becomes interested in her disfigurement. You see, he’s a plastic surgeon and has had some success in that line, convincing her to go through with more than a dozen surgeries. It works, but Segert is worried that he’s created his own frankenstein, a beautiful woman with no heart. As the trial progresses, we get no indication of who the victim was as the story progresses with each witness adding to the tale. Marjorie Main. “Ma Kettle,” has a role as a housekeeper and a witness and character actor Donald Meek is a confederate of Anna’s that testifies against her for a deal. The script was by Donald Ogden Stewart and directed by George Kukor. For more overlooked folms and related matters, as always, drop in at SWEET FREEDOM on Tuesdays. 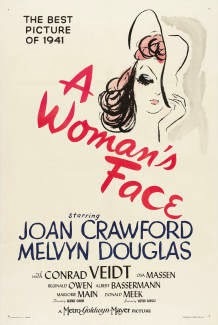 I must admit to an aversion to Joan Crawford. Long story. But I am probably missing some great movies.